With only Sarasota Mayor Liz Alpert voicing her support for the concept, the City Commission this week shot down staff’s proposals for improving Fruitville Road between U.S. 301 and U.S. 41. 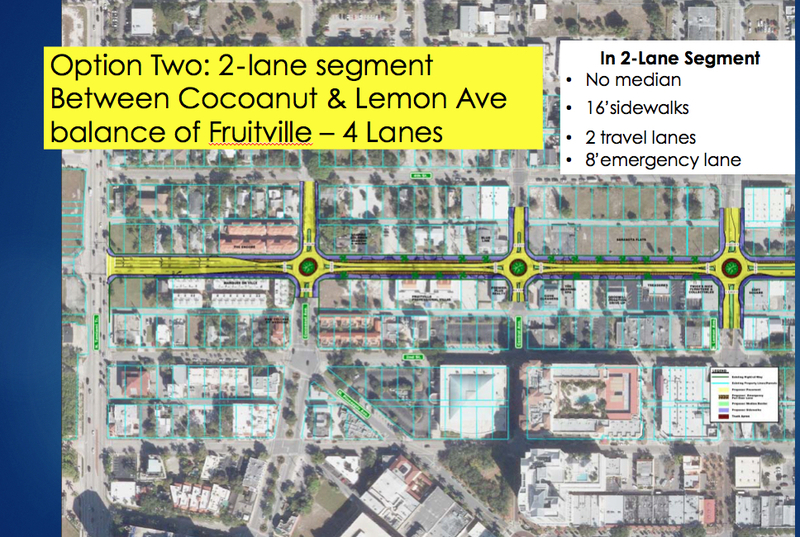 The staff’s preferred recommendation — Option 2 — called for three roundabouts, to be located at Fruitville’s intersections with Lemon Avenue, Central Avenue and Cocoanut Avenue. It also encompassed just one travel lane in either direction, as well as wider sidewalks. 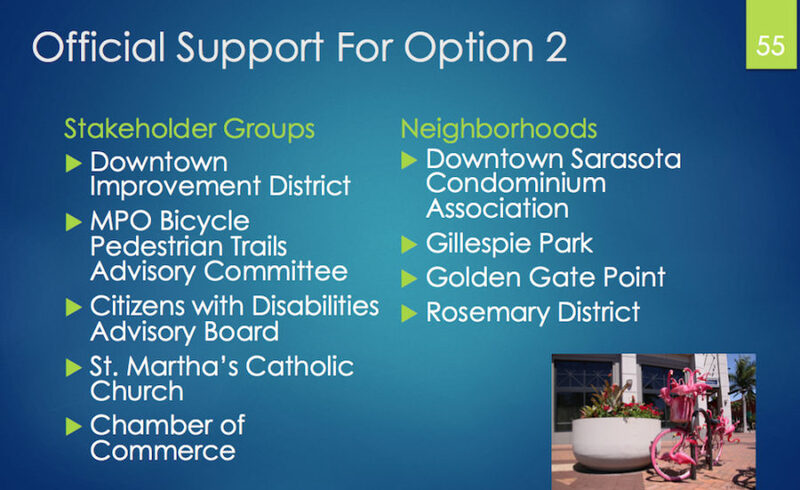 Option 1 included plans to remove the bicycle lane along the affected part of the Fruitville corridor and, instead, encourage cyclists to use Second and Fourth streets. On the latter, signage and lower speed limits could make conditions safer for cyclists, staff explained. 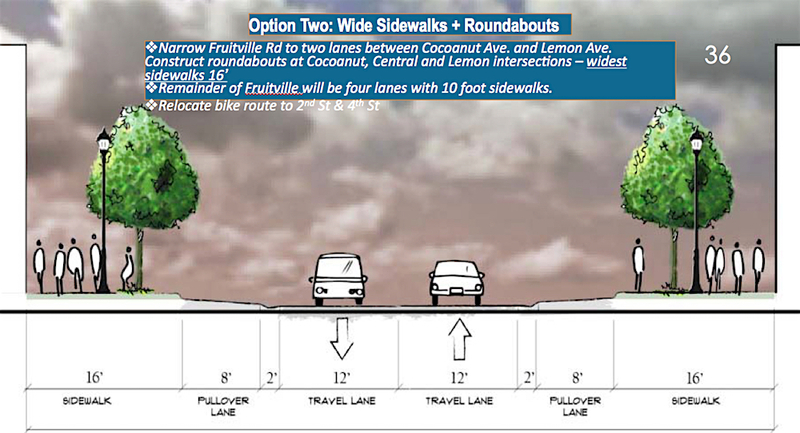 Option 1 called for four travel lanes to remain on the Fruitville corridor, with the sidewalks to be widened to at least 10 feet. 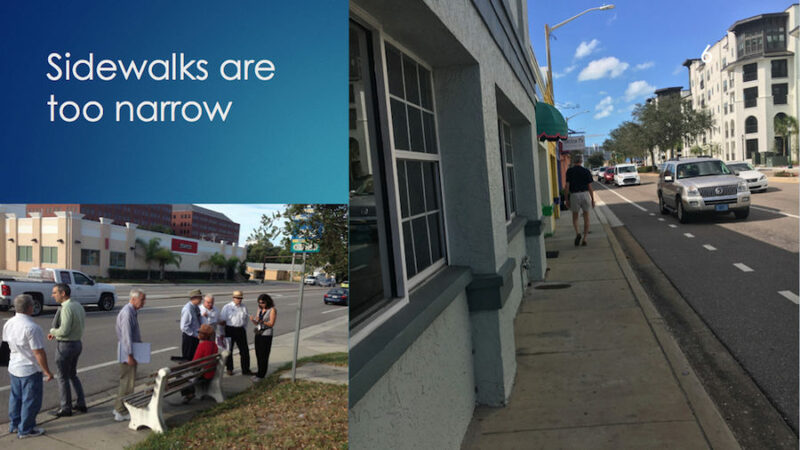 Part of the staff presentation focused on the fact that the sidewalks on Fruitville Road are too narrow, at 4 feet in width, to accommodate people with disabilities. For that matter, Economic Development General Manager Steve Stancel pointed out, two people cannot walk side-by-side in most places. Both options carried a price tag of about $14.3 million, though staff had begun work to try to secure a federal grant that could cover $11,457,400 of the cost for Option 2. The city’s estimated expense of $2,865,360 could be paid out of sales tax revenue allocated to capital projects, as well as tax-increment financing (TIF) funds for city projects and multimodal transportation impact fees, staff said. That followed a plea by Deputy City Manager Marlon Brown to address the problems with the sidewalks. Freeland Eddie indicated that the discussion would be more appropriate when the board members begin work on the city budget for the 2020 fiscal year. Finally, the board members were unanimous in supporting a motion by Vice Mayor Jen Ahearn-Koch to accept an invitation from the Longboat Key Town Commission to discuss regional transportation issues. Maggie D. Mooney, the town attorney for the Town of Longboat Key, was the first speaker to address the board members on April 15, following the staff presentation. At several points during her allocated 3 minutes, Mooney stressed the town commissioners’ “grave concerns” about the Option 2 proposal, especially in the event the barrier islands were ordered to be evacuated with a hurricane approaching. “We want to make sure a regional approach is being looked at,” she said of the proposals for Fruitville Road. 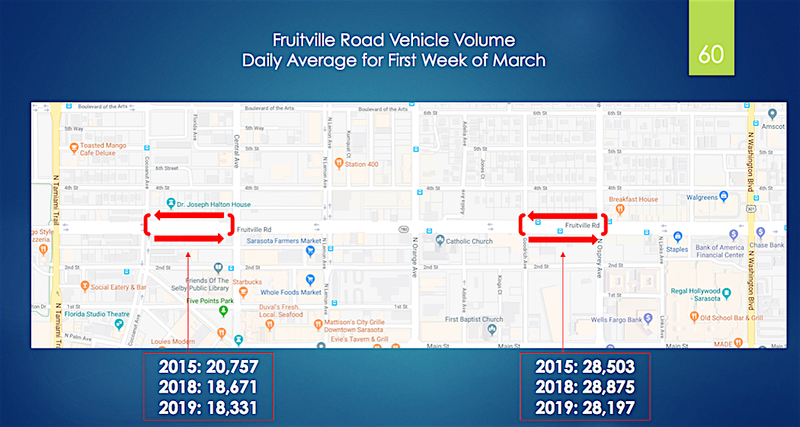 During the April 15 discussion, Commissioners Hagen Brody and Freeland Eddie questioned the validity of the data staff had presented to assert that traffic volumes would not increase to a level that would impede traffic flow with Option 2, especially for drivers from Longboat and Lido keys heading east, who would use Fruitville Road. “I don’t know what you can say that makes me believe these numbers are accurate,” Freeland Eddie told the staff members seated before the board, referring to charts with figures that were part of the staff PowerPoint presentation. Stancel also explained that staff took the annual traffic count from 2017 and adjusted it for growth of 1% a year for 10 years and then adjusted it for another half a percent for an additional 13 years. The result, he continued, was an increase of about 17% in traffic volume for 2038. Brody further voiced concern that if the board were to approve Option 2, with the three roundabouts, rush-hour traffic on the Fruitville corridor would back up in those roundabouts because of traffic trying to flow out of side streets and because of the signalized intersections on opposite sides of the roundabouts. Michael Wallwork, principal at Alternate Street Design of Orange Park — who served as a consultant to city staff on the proposals — tried to assure Brody that that would not be the case. Assistant City Engineer Daniel Ohrenstein added that for the example Brody used — westbound traffic between Orange and Lemon avenues — the distance between the roundabout at Lemon and the traffic signal at Orange would be greater than the distance Wallwork’s calculation indicated for the theoretical queue of vehicles trying to enter the roundabout. Brody told them he was not convinced they were right. Alpert, however, talked of the fact that she drives through four roundabouts every time she heads to City Hall, and she also walks regularly through roundabouts. “It feels very safe,” she said of the latter action. Noting studies that show walking and bicycling are safer in roundabout situations, she added, “If we really want to create a walkable city” and speed up traffic flow, the roundabouts would be the better option. Furthermore, she said, Option 2 includes an 8-foot-wide traffic pullover lane, so drivers could move out of the way of emergency vehicles. Bicyclists also could use that lane, staff said. Commissioner Willie Shaw seconded the motion. “We have transportation planners who are recommending this,” Alpert protested. “I think there’s an Option 3 that’s out there,” Ahearn-Koch said. “I believe Fruitville Road can use some improvements,” she added, but she did not find Option 1 or 2 acceptable. The board’s votes came after close to three hours of discussion and community members’ comments. By The Sarasota News Leader’s count, 17 people addressed the commission. Ahearn-Koch had noted that it was after 11:30 p.m. when the board began taking the votes on the agenda item. The New Urbanism philosophy of walkable communities has spread across the United States, Stancel told the commissioners during the staff presentation. Yet, along the Fruitville corridor, the narrow sidewalks are not the only problem, he continued. People have to walk 68 feet or more, he said, when they use the crosswalks at the intersections between U.S. 41 and U.S. 301. Turning traffic threatens them, he added, and some just give up waiting on a signal to cross, so they dart into traffic. During workshops staff held on the Fruitville Road conditions, Stancel continued, 96% of the attendees said the most important issue was the need for improved pedestrian crossings. 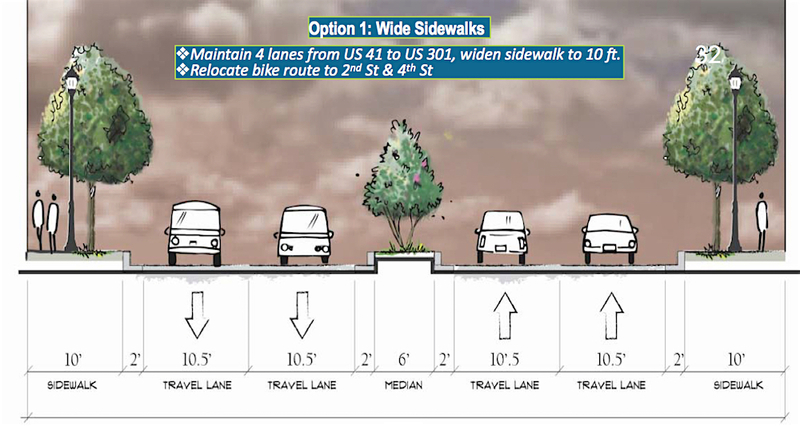 The current cross section of the corridor shows a 4-foot-wide sidewalk on both sides, four travel lanes that are 10.5 feet wide each and 4-foot-wide bicycle lanes. The median takes up another 10 feet, Assistant City Engineer Ohrenstein added. From January 2014 through December 2018, Ohrenstein continued, 244 crashes have occurred, resulting in one fatality and 55 injuries. 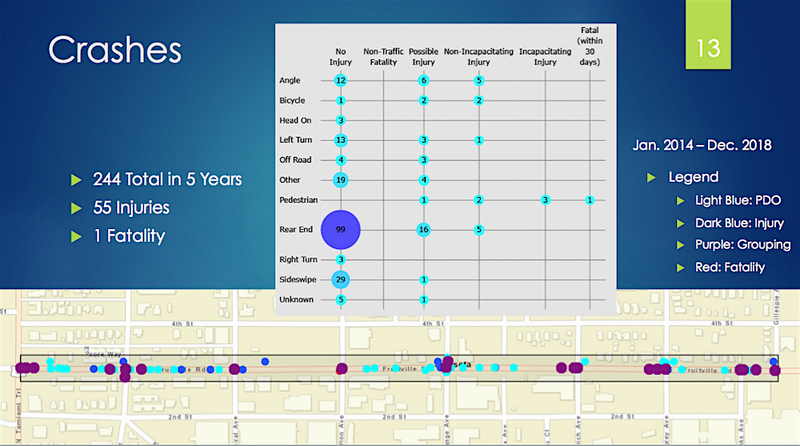 The vast majority of incidents — 99 — were rear-end collisions, according to a graph staff presented. 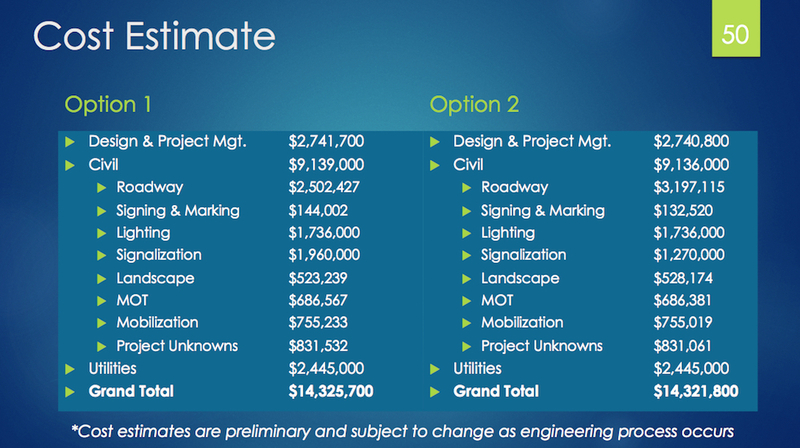 If the commission approved Option 2 that night, Collen McGue, the city’s chief transportation planner, told the board that the engineering design work probably could be completed by the fall of 2020, with construction starting in the fall of 2021, following completion of the roundabout at U.S. 41 and Fruitville Road. Members of the public who addressed the commission after the staff presentation indicated strong feelings of support and opposition. “I couldn’t agree more with Commissioner Freeland Eddie that the data is cooked,” Sarasota attorney Dan Lobeck, president of Control Growth Now, told the commissioners. 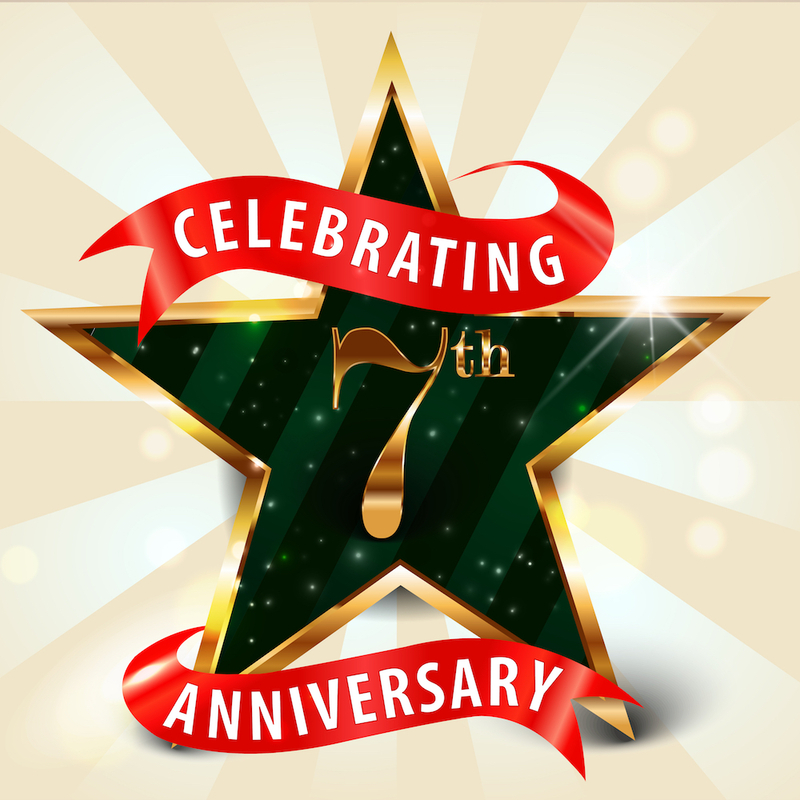 Staff had not taken into account all the new projects within the city, he added, or the extensive growth expected in the eastern part of Sarasota County. 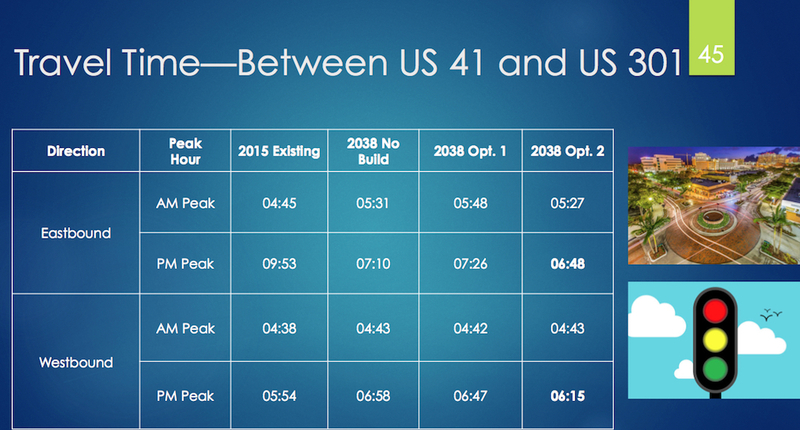 “I’m a believer in science,” Lough continued, adding that he believes the drive time figures. 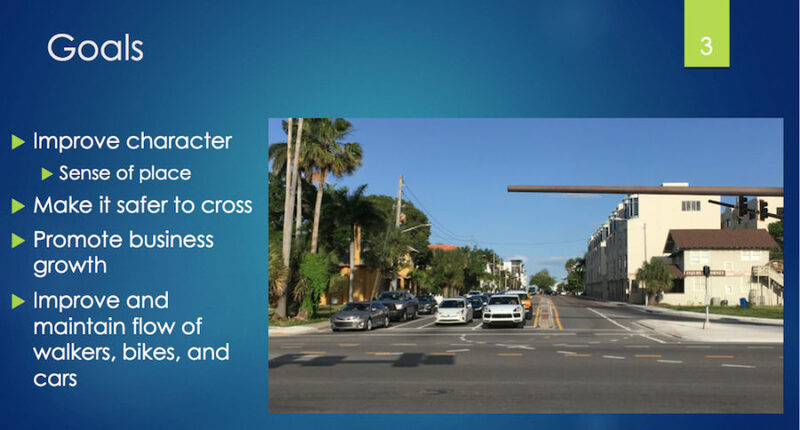 “We are convinced that reducing Fruitville Road to two lanes for only two-and-a-half blocks between Cocoanut and Lemon avenues, installing roundabouts [at the three intersections], with 16-foot-wide sidewalks and pullover lanes is in the best interest of the residents and visitors of downtown Sarasota, the Rosemary District and the barrier islands,” Gannon said.